In 2012, Jeff Hastings was approached to find a solution to the worldwide problem of avocados going brown, as soon as they are cut open. The avocado industry was (and still is) searching for a way to value add their products to achieve greater returns and stopping this browning problem was seen to be the key. Consumers were consistently frustrated with cutting open an avocado, only to find it had already gone brown inside or it was too hard or too soft. There must be a better way. The fruit packing business decided to discontinue their pursuit of value added avocados so Jeff ceased consulting to them late in 2013. However, not deterred by their premature surrender, Jeff continued acting on his own risk and on his own account to keep searching for the solution and to develop a technology that can deliver the desired product – cut avocados that don’t go brown, using only natural means. Remodelling his family kitchen into a food laboratory, Jeff continued researching for several months before he reached the break-through – cuts of avocado remained fresh with no browning for at least 10 days. After a short period of verification the results were stable and repeatable on demand. It was time to see if the market liked it……….. 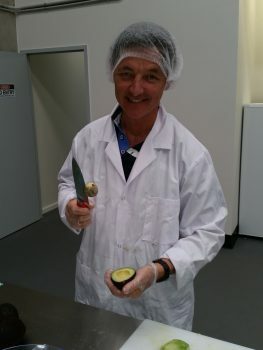 Given the worlds avocado production and consumption is dominated by Mexico, USA and South America, Jeff set sail in 2014 to the heart of the industry to let the world’s largest avocado processors taste & evaluate his new product. Armed with sample packs of cut avocados, he sat down with the leaders of the industry across the USA & Mexico to gauge their opinion, not only to how it tastes but whether they are willing to invest in this new technology. Without exception, they loved the samples and saw a huge market potential – globally. Being the only avocado technology in the world that offers the shelf life, the fresh taste & the food safety, all in a totally natural way, without anything added, this was an easy win. With the product technology sorted and the market excited, it was time to commercialise this outstanding opportunity. Having expended all personal funds to get the technology to this point, Jeff needed an investor. Attracted by promises of multi stage financial investment and global expansion, Jeff partnered with a small private investor group, introduced to him by an Australian lawyer. For several months their promises of funding the technology continued, while the demands on Jeff increased, but the money never came – It turned out to be an elaborate scam. So elaborate that it ended up costing Jeff & his family pretty much everything. However, what they didn’t get, despite several attempts, was the IP on the technology. The patent, industry secrets, the technology and all know-how remained safely in Jeff’s hands. In March 2015 Frank Schreiber was introduced to Jeff by a mutual friend. After months of café meetings around the Sunshine Coast and getting to know each other, Frank realised the potential of this technology and the possible impact on the industry. He also believed that the timing for the introduction of the technology was perfect because of the worlds need for better nutrition, less food spoilage and increased convenience. Shortly after Frank had embraced the technology fully and developed a vision for a new company and a strategy to proceed with the commercialisation. Franks entrepreneurial spirit and his proven record in building up successful companies in Germany, made him an ideal partner for Jeff. 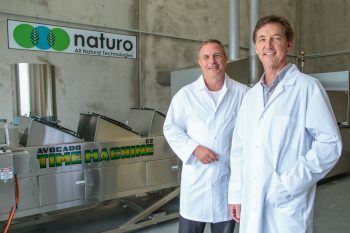 So in June 2015, Frank and Jeff became equal partners and founded Naturo All Natural Technologies Pty Ltd, which was formed to house the avocado processing technology which was named NATAVO ZERO. All names and logos were trademarked and all domains were secured. Frank provided sufficient investment funds to achieve market-ready status, including getting the Australian and PCT (global) patent under way and building the first commercial scale avocado processing machine, known as the Avocado Time Machine, or ATM 2.2. While Frank was working on the structures of the new companies, Jeff worked out how to adapt the Natavo Zero technology to produce an ‘avocado pulp’ product. Although the cut avocado market represents a huge market opportunity globally, the avocado pulp market is potentially even bigger. Existing HPP technology used to produce pulp has a major problem with its very short shelf life (a few hours) once the pouch is opened and this represents a significant problem for users of this product. After some extensive R&D with the Natavo Zero process, Jeff presented the solution which delivers an avocado product that tastes just like fresh avocado and has an extended shelf life of 7 days after the pouch is opened. Nothing is added, it is all natural and it is another first for the avocado industry. With the Naturo flag flying high, the new partners set off to meet with the world’s largest avocado processors across USA, Mexico and Peru, to let them see and taste the Natavo Zero avocado product and to begin commercial negotiations on future business dealings. The problems with existing technologies capable of producing cut and pulp avocado are obvious and well understood by the whole industry. Existing cut avocado technology need chemicals or acids added to slow the browning, but these cause an unpleasant taste on the avocado, and there is no “kill step” with this technology meaning food safety is at risk. HPP technology used to produce most of the worlds avocado pulp & guacamole has no shelf life after the bag is opened and requires a very high capital entry investment. The Natavo Zero technology solves all of these problems, while a great fresh taste is retained, a proven “kill step” is provided, nothing is added and the shelf life is significantly extended. Without exception, the approached avocado processors were very impressed and serious about progressing discussions. The only real issue raised by the larger processors in Peru and USA was the capacity of the ATM machine – they wanted a bigger version of the machine with higher daily throughputs. Back in Australia and full of good spirits Jeff re-engineered the ATM to allow Naturo to offer a version of the ATM with double the capacity, 500 Kg per hour (ATM 3.5). Concurrently, an independent validation and proofing of the technology and machinery was initiated. One of the USA’s most respected, Government approved laboratories, The National Food Laboratory (NFL) in San Francisco was engaged to perform a pathogen challenge tests on the processing technology, focussing on Listeria, e.coli and salmonella. The testing subsequently proved that the Natavo Zero technology kills pathogens over and beyond the limits set by industry. On this basis The NFL approved and validated the Natavo Zero process and deemed any products produced by it can be regarded as food safe. The result of this tests should allow all Natavo Zero products to enter the US market under FDA approved conditions. Next was the machine. To achieve global sales of the ATM machines, they must meet certain standards of manufacture and operational safety, and then be accredited by the appropriate authorities around the world. A certification expert was engaged to review, test & validate every design and performance aspect of the machine. As a result, the ATM machine was fully certified and proven compliant with the regulations of all relevant bodies FDA, ANSI, CE, ISO, AS & OSHA, meaning they could now be introduced with the technology onto the global market. In January 2016 it was time to fulfil the requests of the some processors and invite them down to Australia and see Avocado Time Machine in full operation mode. Processors from Peru, Mexico, USA and Australia found their way to our new premises on the Sunshine Coast and had a first view on the capabilities of the machine and a taste of freshly made avocado slices, dices and pulp. The response was overwhelmingly positive and led to intense commercial discussions. These discussions are ongoing with several companies across the Americas and around Australia. With every aspect of the technology, validations, certifications, patents and the market firmly in place, Naturo is now ready to commercially engage fully with the global industry and set the new standard in avocado processing. The future for Naturo looks very bright indeed.